Since its conception, Brillo has been synonymous with deep cleaning but Brillo can no longer solely compete in the kitchen arena. the brand beckons for a repositioning in the marketplace that takes it beyond the traditional household uses. Brillo is not made to make your life easy, its made to do the job right. those who take pride in the process do not concern themselves with quick + easy. Brillo is for those who live to work. those defined by doing. Refocus Brillo as a flexible tool. To deliver the message, we’ll celebrate the true fanatics of Brillo, those that live to work. Steel wool packaging for those who live to work should not be flashy or complicated. the new packaging puts an emphasis on functionality and texture. there are three sizes (small, medium, and large) and three grades (1 being the finest, and 3 being the roughest.) the packaging box shows the physical reflection of the grade on the left hand side, along with the corresponding code (s1 - meaning small, grade 1) on the right. 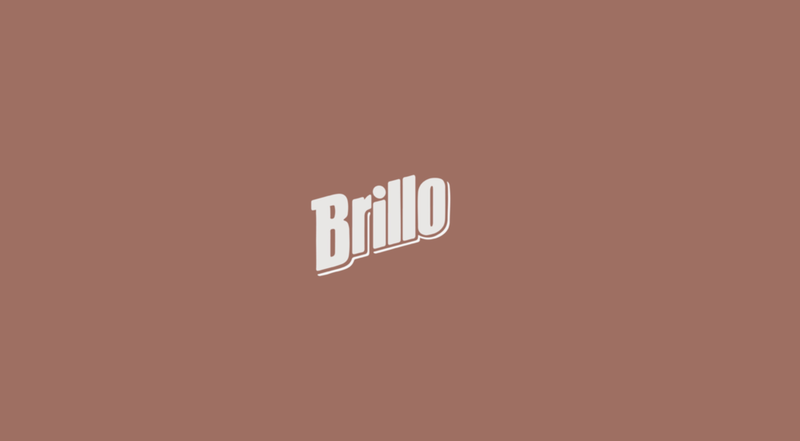 We’ve created a new Brillo site which helps the brand convey it’s voice. Meanwhile, it’s a great tool for the customer to choose and customize their Brillo tools. A service that allows those buying steel wool pads to buy them in bulk and not have to think about looking for them in a store aisle. In store distribution | shift from cleaner aisle to the tool aisle with a product testing display.